Museum jobs are hugely varied and there are hundreds of us who work behind the scenes caring for collection objects and getting exhibitions ready. One of these roles is undertaken by our collection managers. 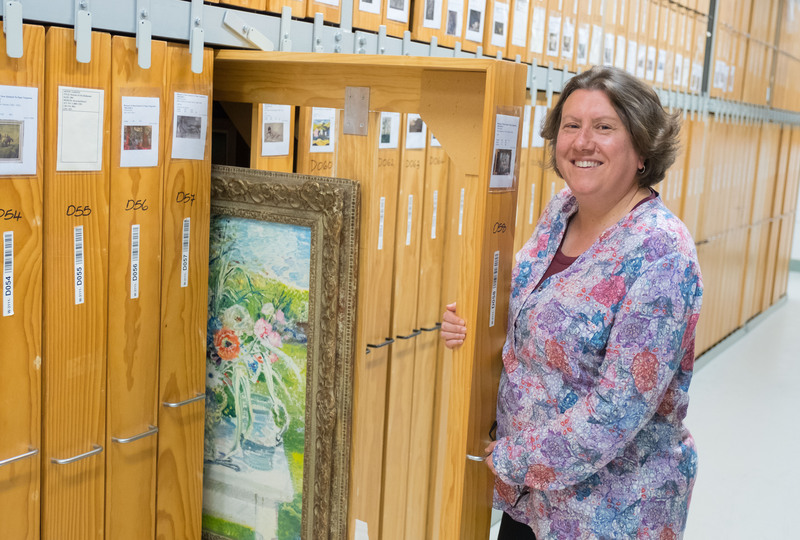 Art collection manager Anna Brookes shares with us what she gets up to day to day and her tips for getting into the industry. How long have you been an art collection manager and how did you get here in the first place? I’ve been in this role almost 13 years. After taking a few zig-zag turns through a number of ‘incarnations’ including graphic design, teaching, and project management it eventually clicked that arts administration was my thing. I went on to study Arts Management and Museums Studies at postgraduate level. Long story short: that led to my current job as a collection manager at Te Papa. No one day is typically the same. One day might involve organising works for an exhibition, enabling viewings, giving conservators access for treatments, and making sure a painting or object has all the right hardware to be hung or placed or suspended. The next day might be very desk-based – answering emails, sending researchers information, planning to get an object across town, across the country, or perhaps from another country to here. I often say I’m a librarian of objects. It’s a simplistic explanation but an easy reference point for most people. Broadly speaking, collections come in by purchase or gift or donation, and they go out – externally through loans or internally for exhibitions, photography, or conservation. I look after that process and all the bits in between. Those bits involve things like managing information, movement logistics, enabling collection access, looking after storage, and physical care of the collection. Do you have a favourite memory/project here? In 2007 we acquired a work by John Reynolds called Cloud, made up of over 7,000 small canvases each containing a word or phrase from Orsman’s Oxford Dictionary of New Zealand English. When it was simultaneously shortlisted for the Walters Prize, a request came in to borrow it for exhibition, literally before the work came in the door. In order to be loan-ready we needed to devise a project to quickly process the acquisition. 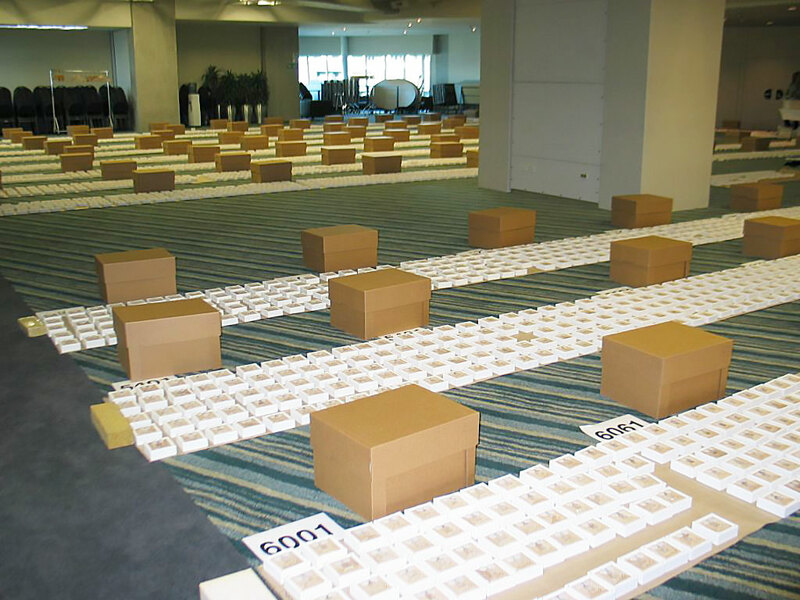 This included a whole weekend of unpacking and sorting – we covered the entire floor of our Oceania functions space. We employed three contractors to condition check and physically register each part and the design of a system of storage to enable us to locate individual canvases within 600 stackable boxes. By setting daily and weekly targets – and managing to retain a sense of humour – we completed just before our deadline, ready to send off to the pre-prize show at Auckland Art Gallery. To be honest, looking back it was one of those experiences that you didn’t necessarily enjoy in the moment – the pleasure is in the ‘having done’. It had all the ingredients of good drama or good rugby game – the challenge, the teamwork, the possibility of failure, and the victory of getting that last canvas over the line – number 7,081 (Pohutukawa). Any advice for those wanting to work in collection management? For starters I think it’s always good to ground yourself with undergraduate qualification in an area that interests you. If you can, volunteer in a gallery or museum and get a feeling for what you’re drawn to. Ask lots of questions. A good museum studies postgraduate qualification is also useful (and often expected), not just for the content of the coursework but also for the networks and experience that it can offer through practical projects. Trying on a few hats was an important part of getting here for me as well – there are certainly ‘other-life’ skills that I use on a daily basis. It’s important to have a plan, but don’t be scared of straying from the linear. As far as personality traits go I think it’s useful to be a detail-oriented person, to enjoy process-driven structures and to be happy working behind the scenes. I’m energised by being around our taonga and feel privileged to have the opportunity to serve as Kaitiaki, but it’s the objects that sparkle, not me. And that’s ok. Thanks Dion. And yes ‘Cloud’ definitely does echo the same type of processing you (and Bev Moon) undertook for Peter Robinson’s ‘In search of the umworld’ [2001-0013-1 – for reference on collections online]. You’ll be pleased to know your packing has stood the test of time – you can’t beat those stackable plastic bread trays as a storage system – sometimes low-tech is the superior solution! I thoroughly enjoyed the read Anna. As I’d expect from a sparkling Collection Manager who also includes the detail of the final accessioned work and its title; number 7,081 (Pohutukawa) now that’s impressive! Brings back fond memories in my time as a CM, working alongside Ms. Moon processing the Umm world acquisition of a diminutive 600 + objects. I trust the packing is still holding up?